COLUMBUS, Ohio – The No. 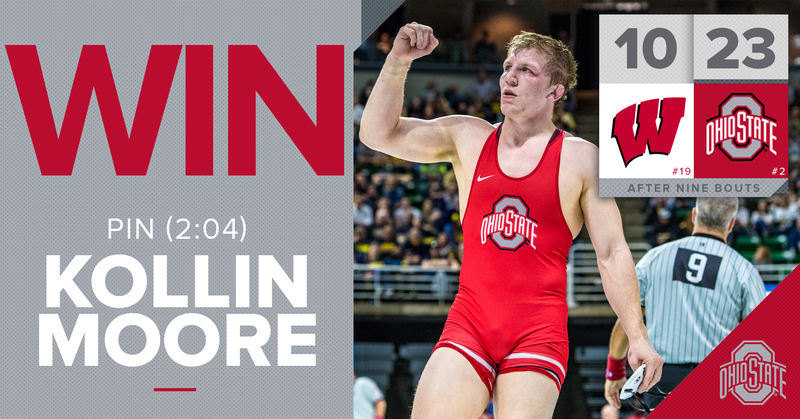 2 Ohio State University wrestling team (3-0, 1-0 Big Ten) began the 2018-19 Big Ten slate with a 23-13 victory over No. 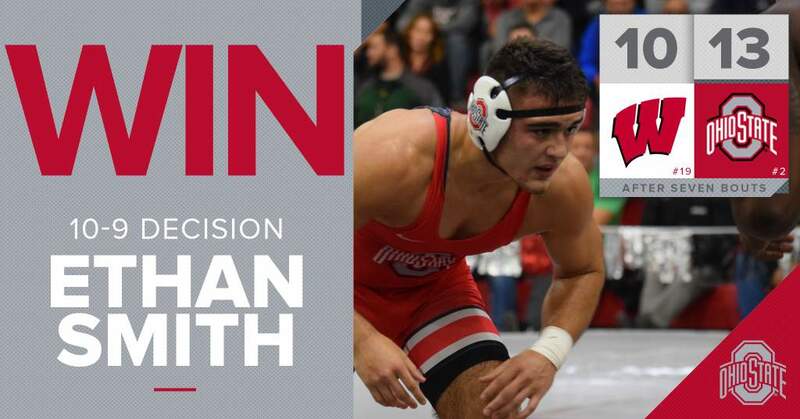 19 Wisconsin (6-1, 1-1 Big Ten), highlighted by redshirt freshman Ethan Smith’s thrilling come-from-behind win over No. 9 Ryan Christensen in the 174-pound bout. Micah Jordan, Myles Martin, Joey McKenna, Kollin Moore and Luke Pletcher were all triumphant as well. Brakan Mead (125 lbs) lit the scoreboard first, recording a first-period takedown on No. 20 Connor Brown. The nationally-ranked Badger would erase the early 2-0 hole though and notch seven unanswered points for the 7-2 win. 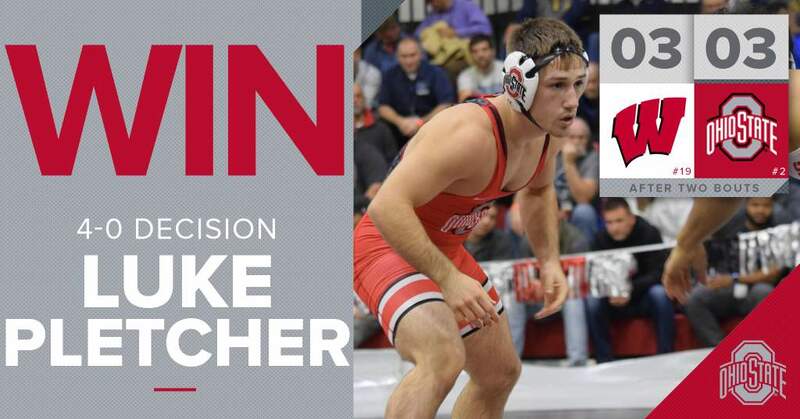 Pletcher evened the team score at 3-3 by virtue of a 4-0 decision over Jens Lantz. After a scoreless first frame, Pletcher hit the deck to start period two. He broke free and then tallied the bout’s lone takedown to carry a 3-0 edge into the third. Pletcher’s riding time point was the lone tally there, and he walked off the mat with a 13-1 season record in-hand. McKenna took the mat next for the Scarlet & Gray at 141 pounds. The senior from New Jersey extended his unbeaten streak to start the season to 10-0, handing 12th-ranked Tristan Moran a 14-2 major decision. McKenna got to work immediately, taking down and turning Moran in both the first and second periods. He continued to pile on the points in the third, ultimately washing out as a 14-2 winner. 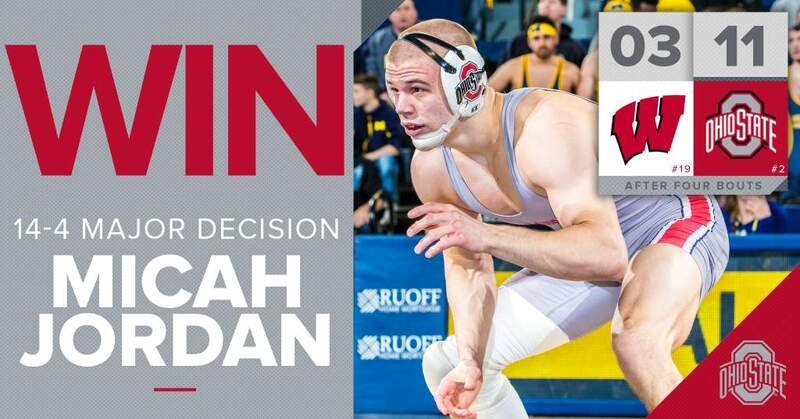 Jordan earned a similar fate at 157 pounds, securing a 14-4 major decision over his top-20 foe (No. 18 Cole Martin). Jordan corralled a half dozen takedowns by bout’s end and pushed the Buckeyes ahead 11-3 entering intermission. Elijah Cleary and Ryan Ferro got the starting nod at 157 and 165 pounds, respectively, the first career dual appearance for Ferro. Awaiting was the Wick Brothers, Zander and Evan, both picking up wins for Wisconsin and closing the team score gap to 11-10. With momentum swapping ends of the mat, Smith was called upon to face No. 9 Ryan Christensen. The young Buckeye answered the call in a big way, bursting out of a 4-0 deficit and storming back to win 10-9. The crowd of 3,275 erupted when Smith caught Christensen in a cradle for the go-ahead move at 6-5 in the second stanza. Smith elected to start the third period on bottom and followed with his second reversal of the day. Christensen then escaped before Smith took him down for two more tallies. It was far from over though as Christensen hit a reversal, too, and had a cradle of his own locked up. Smith fended off the near-fall points and remained belly down, holding on for his first career top-10 win. Martin and Moore extended the Buckeye celebration with victories in the subsequent two bouts. 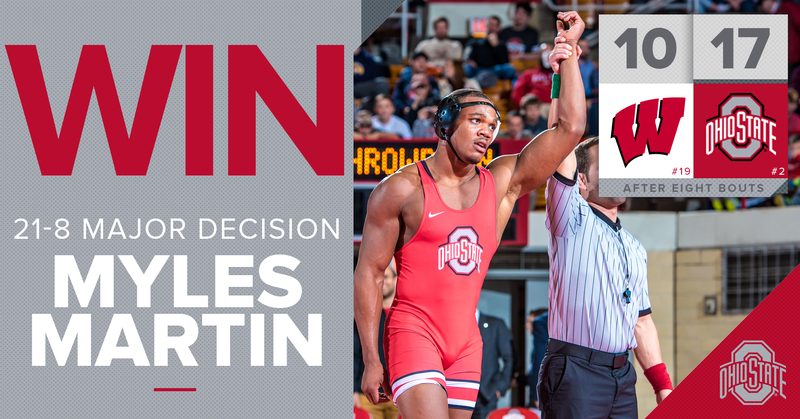 Martin racked up three takedowns in all three periods en route to a 21-8 major decision. Moore registered three takedowns in his only period on the mat, putting an end to it with a fall at 2:04. 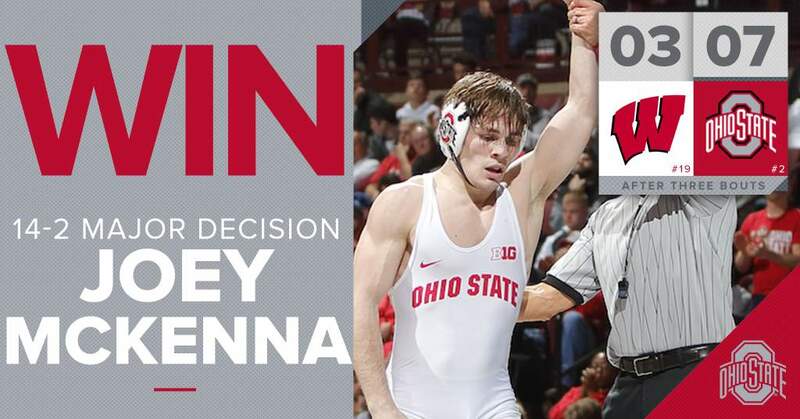 His pin and seventh overall win this season sealed the deal for Ohio State. A battle of talented redshirt freshmen capped the evening at St. John Arena. Wisconsin’s Trent Hillger, ranked ninth nationally, came away as a 6-1 victor over No. 14 Chase Singletary.